Hyundai Motor Group’s Chairman Mong-Koo Chung met with India’s Prime Minister Narendra Modi to exchange ideas on Korea-India’s auto industry’s cooperation and mutual development. India’s Prime Minister, Mr. Narendra Modi has promoted market-friendly policies to boost growth in India’s economy. India’s auto industry’s annual sales have increased 3.2% under Mr. Modi’s strong leadership, this year projected to be 2.74 million units, a 7.8% increase from last year. 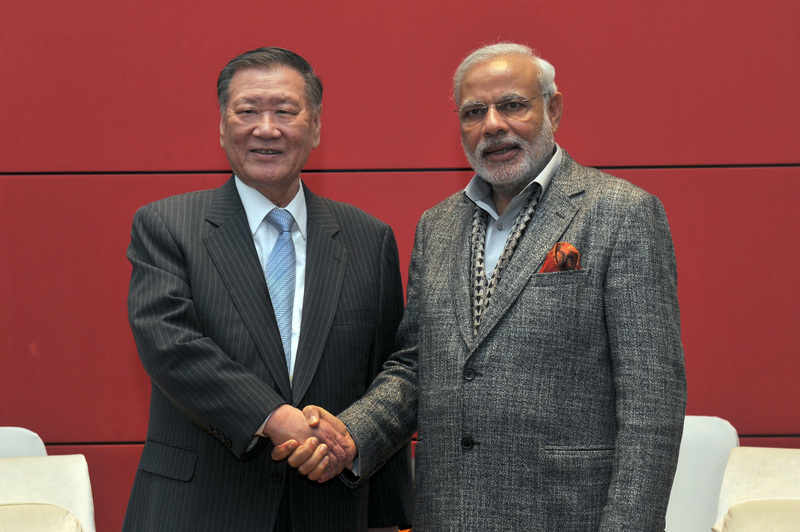 India’s Prime Minister Mr. Narendra Modi replied “It is a great pleasure to meet with Chairman Chung. Hyundai Motor plays a key role in India’s auto industry. India will actively seek possible ways to continue its cooperation with Hyundai Motor. I hope Hyundai Motor will become a leading global company through its success in India.” Hyundai Motor, in its first year in the market, ranked second among the car brands in India. It continued to launch strategic models specifically targeting India and now leads the market by selling 400,000 vehicles annually. The Indian plant can currently produce up to 650,000 units operating on three shifts and improving the UPH (unit per hour) within its two plants.Hyundai Motor Group started its railway business in India with Hyundai Rotem securing its first order in 2001. By securing subsequent orders such as Bangalore and Hyderabad metro deals, Hyundai Motor Group has the largest market share in India’s EMU market.In the construction business alone, Hyundai Motor Group has successfully secured business in bridges, harbors, and power plants. Hyundai Motor Group is aiming to expand its business as the Indian government is actively investing in infrastructure projects. In the auto component business, Hyundai Motor is helping its business partners in its expansion into the Indian market. Currently, 71 component suppliers including 42 1st tier suppliers have expanded into the Indian market along with the Hyundai Motor and continuing its growth in the market. As the auto industry output continues to increase Hyundai Motor will support its component suppliers to attain business with other global auto companies in India.